What does it take to turn a pumpkin into a work of art? 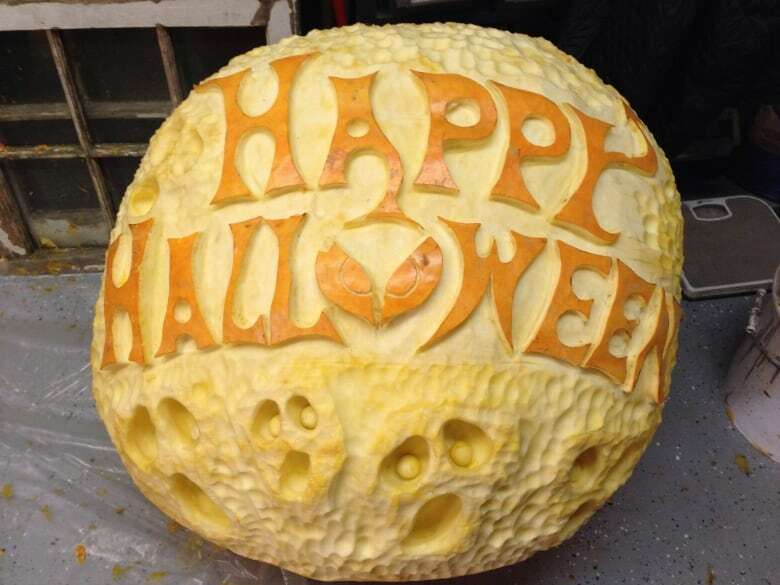 Four "extreme pumpkin carvers" share their secrets with CBC Radio's The Early Edition. What does it take to turn a pumpkin into a work of art? "Extreme pumpkin carvers" Clive Cooper, Bruce Waugh, Craig Mutch and Roger Chaisson carve up hundreds of pounds of pumpkin each year for a Halloween display at Oakridge Centre. They shared some tips with CBC Radio's The Early Edition. Look for a heavy pumpkin. They provide lots of dense material to work with. Let the shape and colour of your pumpkin guide your imagination. For example, you can turn a large, green pumpkin into The Incredible Hulk, or use the stem as a nose. Use physical features of your pumpkin as elements of your design. Rummage through your kitchen drawers for tools. Ice cream scoops, melon ballers, citrus zesters, sharp paring knives, cheese graters and vegetable peelers all make great tools. Ribbon tools (used for working with clay and easily found in art supplies stores) are also useful. Wear gloves to prevent cuts. Wash the pumpkin before carving, but consider waiting until you're finished carving before you clean out the pumpkin guts. This will give you more structural integrity while carving. You can hollow out the pumpkin after you're done. Note that you don't have to go through the top — you can cut a small hole into the back of the pumpkin instead, but you'll have to use an LED light instead of a candle to light your masterpiece. Use a marker to help map out your initial cuts. Scrape the skin off the surface and start sculpting. You don't necessarily need to cut all the way through the pumpkin to create a striking effect. Interesting touches like eyebrows or laugh lines will help your pumpkin stand out. Look to a favourite cartoon, gaming or movie character for inspiration, but don't be afraid to let your imagination run free. Have fun and don't be too fussy. Sometimes you just need to start carving to get into it. Take pictures of your creation. Pumpkin art won't last forever! You don't have to be a master carver to make a unique pumpkin. CBC Vancouver's The Early Edition asked for photos of your carved creations, for a chance to win a CBC swag bag.